Your baby will get curious about shapes with everyone's favorite monkey in the new Curious Baby puzzle board book, where they will explore diamonds, flowers, hearts and more. Oversized, punch-out puzzle pieces, bouncy poetry, and vivid illustrations make this a perfect pick for b... read full description below. Little ones will discover the world of everyday shapes--a diamond, flower, egg, star, and heart--with this interactive puzzle book. 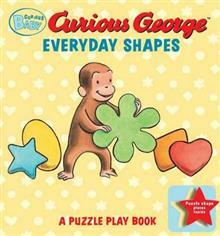 Each sturdy, shaped puzzle piece can be lifted off to reveal a scene of George interacting with the shape in the world around him--and some additional shapes on the back of the puzzle piece! With sweet illustrations, bouncy rhyming verse, and shaped puzzle pieces to touch and explore with, this book is the perfect way to introduce the baby in your life to the world of shapes!